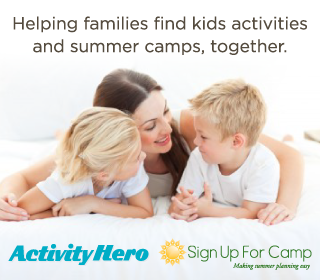 SignUpForCamp.com and ActivityHero.com merge to make it easier for parents to find & plan kids summercamps and activities. Both companies started by looking at the problem from a busy mom's perspective, and have grown organically because of similar solutions to a real pain point. Silicon Valley based family focused startups, SignUpForCamp, the website that is popular for making summer camp planning easier, and, ActivityHero, the site to search and register for kids after-school activities are pleased to announce their merger effective March 26. The merger of these two companies brings together complementary services of kids activities and summer camps, and a comprehensive set of tools from planning to registration. This helps the end users, who are busy families, find, plan and register for all out-of-school time activities in one place. “Both companies started by looking at the problem from a busy mom's perspective, and have grown organically because of similar solutions to a real pain point.” Says Tatyana Kanzaveli, CEO of Getwear and advisor to ActivityHero. “The merger expedites the expanded solutions they wanted to provide to each of their existing users”. Founded by a mom in 2009, last year alone, SignUpForCamp.com helped over 120,000 families find summer camps. With over 3400 camp locations listed nationwide, and detailed camp information including schedules, prices and extended care, SignUpForCamp offers parents the ability to search specifically for their criteria including age, camp activities, zip code and schedule. 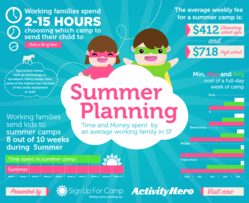 With their popular calendar planning tool that parents use to create and share the summer plans of their children with other parents, and the bi-weekly camp discounts emails that keeps parents informed about discounts from camps, SignUpForCamp has been a huge hit with busy moms who appreciate the time and money saving help. Meanwhile, founded by another frustrated mom in 2011, ActivityHero.com has been helping Bay Area families find after-school activities during the school year, like ballet classes, piano teachers, swim coaches and more. While parents save time using the activity search engine, it's their online registration and roster management system that has found a big following, especially with Bay Area schools using it to manage their after-school activities. With the seamless integration of vendor information, parent registration and school roster management, both families and educators love the ability to get everything done paper-free and in one location. The websites, which currently serve San Francisco Bay Area and the Delaware Valley Area, are expanding to five new cities this Summer including Los Angeles, New York, Seattle, Miami and Houston. Sign Up For Camp was founded by mom and CEO of Sheet Music Plus Jenny Silva in 2009 when she found herself exchanging 100s of emails and spending hours planning and coordinating summer camp schedules for her son with his friends. While Jenny will continue in an advisory role, Peggy Chang who worked with Sign Up For Camp will assume the COO role for the newly merged company. ActivityHero was founded by mom and technologist Shilpa Dalmia in 2011 when she realized that no one else was helping busy moms solve the problem of finding kids after-school activities that fit their schedules and also recommended by their friends.